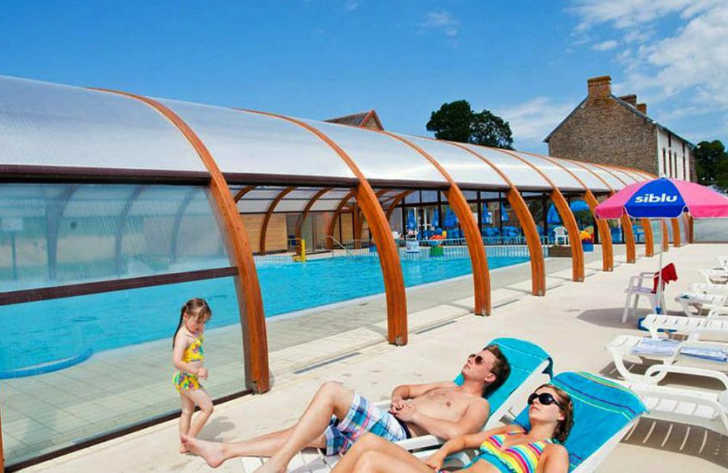 Domaine de Litteau is a 4 star campsite located in Litteau in the Normandy region of France. Domaine de Litteau is owned and run by Siblu and as such not only boasts a fantastic location but also a great range of facilities and activities. The campsite is great for those looking for a fantastic place to relax and enjoy the French countryside whilst still offering enough to keep the whole family busy. Located in the heart of the Normandy countryside on the edge of the Cerisy Forest, Domaine de Litteau offers the best of both worlds with plenty of outside space to explore whilst being in a great location from which you can discover more about this fantastic region of France. It doesn’t really matter what sort of holiday you’re looking for as you’re sure to find something to suit everyone at Domaine de Litteau. The large beaches, stunning medieval towns, thought provoking battle sights and fascinating historical sites are all within a short distance of the campsite and the activities available make this a superb choice for any family. If you’re looking for a campsite that’s right next to a beach then Domaine de Litteau campsite is not for you. The nearest beach however can be found just 30km away and is the famous Omaha beach. Here you’ll find a stunning beach as well as lots of things to see relating to the D-Day landings so if you’re planning on heading here make sure you leave enough time for both. On-site at Domaine de Litteau you’ll find a lovely swimming pool complex that includes a heated indoor pool, children’s pool, children’s splash area, slide and spa facility. Domaine de Litteau campsite offers a comprehensive selection of activities and facilities on site and also nearby to ensure you have a fantastic family holiday. On-site activities at Domaine de Litteau campsite include archery, a multi sports ground, table tennis, boules, volleyball, 2 fishing lakes, football golf, bouncy castle, zip wire, box track, horse riding, walks through the woods, a massive playground area and cycle hire. Facilities available at Domaine de Litteau campsite include WIFI, snack bar, takeaway, bar, grocery shop, animation team, kids club, washers and dryers. Accommodation at Domaine de Litteau campsite includes 2 and 3 bedroom mobile homes that are available from Siblu and Suncamp.